Earlier this morning, the NHL and NHLPA reached a tentative agreement on a new collective bargaining agreement. Yes, there is still work to be done. All the details need to be looked at, players need to get back to their teams from all around the world. Then, after all of that, only one week of training camp will take place before the NHL season finally gets under way. Take note, NHL rosters have 20 players including 12 forwards, 6 defensemen, and 2 goalies. 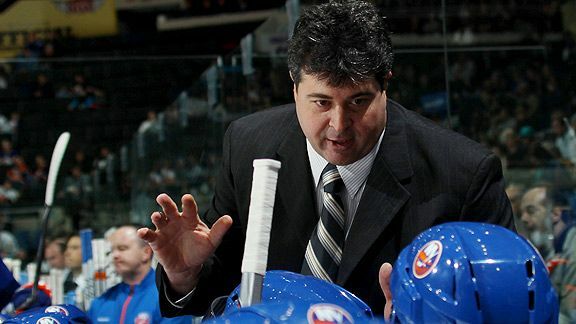 Head coach Jack Capuano is going to have many tough decisions to make. There are a few new Islanders that will need to get used to their new surroundings quickly. Players have been playing on the other side of the world, and some haven't been playing at all. After all is said and done, the season will start. Putting all of the many details aside for now, here are the lines that I think the Islanders will yield when they hit the ice in about two weeks. Tavares and Moulson have been together since Tavares' rookie season. Since them, they have became one of the best scoring duos in the entire NHL. Tavares has been busy this season, playing on the same team as Mark Streit in the Swiss league. (Click on his name to see a highlight._ Hopefully he won't have any problems adjusting back to New York time. For the past few years, they have usually had PA Parenteau flanking them. However, Parenteau left the Islanders and went to Colorado. Now, the Islanders have Brad Boyes. In 2008-09 with the Blues, Boyes scored 43 goals. The next season, he had 72 points. Unfortunately, over the last two seasons in Buffalo, he has just a combined 13 goals. Boyes has prove he can score at an elite level in the NHL, and I think that playing with the two best offensive weapons on the team will boost Boyes back to relevance. This line is almost guaranteed to be together. They have been for the past few years, and I don't see anything that will separate them. Although Grabner may have had a sophomore slump, he picked it up toward the end of last season to reach the 20 goal mark. Nielsen is by far the best defensive forward on the team, and combined with his dominance in the shootout, he is the easy pick for the number two center. Kyle Okposo got off to a very slow start last season, not scoring until a month into the season, yet he finished with a career high 24 goals last season, and with a shortened season, I can't see him surpassing the mark. These three will be together, as they have one thing the Isles have lacked over the past few years, chemistry. This line is one that that is not even close to set in stone. Matt Martin signed a new contract minutes before the lockout got underway. He has become a fan favorite for his big hits, and last year he proved that he can score more than just one goal. Martin was never afraid to take contact, or initiate it. He proved even more valuable when he drove to the net and got good shots. Josh Bailey has been playing in the German league, where he had seven points in his first four games. It is doubtful, but if Bailey can keep up a good pace on the Island, the sky is the limit for the former 9th overall pick in the 2008 draft. David Ullstrom is as big a question mark as any on the Islanders. He has been playing with the Isles AHL affiliate in Bridgeport. He was great last year in his time on Long Island, but he may not be completely healthy. He has missed 11 games for the Sound Tigers. However, if he is healthy, he should be in the NHL. These three players, all very young, can be a good line to turn to late in games when Tavares and co. need some rest. Guess how many goals the three of these players combined for in the NHL last season? One. One single goal. It was scored by Marty Reasoner. (See link on his name.) Marty Reasoner was a complete bust last season for the Islanders, but I can't see them getting rid of him until the end of his contract. Eric Boulton played in 51 games for the Devils last season, yet he didn't register a single point offensively. He did get 115 penalty minutes though. The Islanders got him because they want him to be the type of player that Zenon Konopka is. A tough, gritty forward, who isn't afraid to drop the gloves with anyone or stand up for a teammate. If you've been following the Islanders for a few years, you probably remember Jesse Joensuu, who played last season in the Swedish league. Joensuu should be on the NHL roster when the season begins, and hopefully his year in Sweden helped him become a better player. This line probably won't produce much offense, but they can change the momentum of the game, with a hit, fight, or big play. After missing all of the 2010-11 season due to a fluke injury during training camp, Mark Streit came back better than anyone expected him to. He was the leader of the Islanders power play, played in every game, and was by far the Islanders best d-man. Throughout last year, Streit didn't have a great defense partner, so the Islanders went out and got him one on draft day. Over the past decade, Lubomir Visnovsky has been one of the best offensive defensemen in the NHL. An All-Star back in 2007, Visnovsky spent last season with Anaheim where he got 27 points in 68 games. Shortly after he was traded in June, Lubomir filed a grievance with the NHL to have has trade to the Isles voided. Unfortunately for him, he lost that grievance. There are rumors that he may stay in the KHL this season, but if he does, don't be surprised if he gets the Evgeni Nabokov treatment. If he comes to the Island, the duo of Streit and Visnovsky could be one of the best offensively in the NHL, and they could lead the Islanders power play to the top. More question marks with this pairing. Travis Hamonic has been with Bridgeport all season, but he has missed 15 games with an injury. He should be ready to skate next week, and if he is, that would be the best timing. Andy MacDonald has been playing in the Czech league, where he recorded five points ini 21 games. These two have been the best defensive pair for the Isles for the past two seasons. They will be on the Islanders for the next few years, and they are just starting to hit their stride. If healthy, this duo will be on the Island and doing what they've been doing for the past few years. The Islanders signed Matt Carkner to a three year deal before the lockout. Matt Donovan has played in three NHL games. Unlikely pairing? Yes, they are one. After Carkner, the last defenseman spot is open for the taking, and I believe Donovan is going to take it. He should earn an invite to training camp, and work his way onto the roster. He has 17 points in Bridgeport this season, and he has been healthy for the whole season. Carkner is a very physical player, he had 190 penalty minutes a few seasons ago. Carkner, like Eric Boulton, will provide a physical presence the Islanders have lacked over the past few years. Together, the duo of Matts will be the Isles final pair of defensemen, but this is the one that could change very quickly. Heading into this season, there is absolutely no question who is the starter and who is the backup. DiPietro is starting right bench, so Nabokov will start in goal. If there is one person who can single handedly lead the Islanders, it will be Evgeni Nabokov. He was 19-18-3 last season, ending any goalie controversies on Long Island. If Nabby plays like he did with the Sharks over the past decade, the Isles could be on their way to the playoffs. If I had anything to say about Rick DiPietro, other than a buyout would be a great idea, I would be happy to write it here. Just keep Nabby on the ice, DP on the bench, and I think the Isles should be fine in net this season if they both stay healthy. I think such players like Nino Niederreiter, Ryan Strome, Brock Nelson, Griffen Reinhart, and Aaron Ness will not be on the NHL team to start the season. These combinations are based on what the Isles have now, if they make another move, that's out of my control. If you are questioning any of these combinations, I'd love to hear from you in the comments. I can't wait for the season to start, and get back to the way things used to be.